Mold litigation: Next tort arena or passing fad? Toxic mold has become a national health and property damage issue, resulting in an increasing number of lawsuits. In fact, a jury in Texas last year awarded $32 million to a family who sued their insurance company after suffering from mold growth in their home. (Ballard v. Fire Insurance Exchange). Serial litigation is a result of that hallmark case with lawsuits focusing on health claims and property damage, according to Jeff Alitz, partner at Donovan Hatem in Boston. Was it a momentous turning point in the lives of an underpaid labor class just learning the power of organizing? Or did the chaotic bargaining sessions make it impossible for management to settle a contract before a strike was called? It depends on which side of the table you sat. MBA President Joseph P.J. 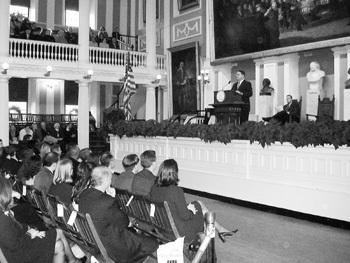 Vrabel was a featured speaker during the Dec. 13, 2002 bar admission ceremonies at Faneuil Hall. More than 1,500 new attorneys joined the profession during this most recent round of enrollment.